Named for a fictional band in a New Order music video, The Killers were indie darlings of the mid-aughts. 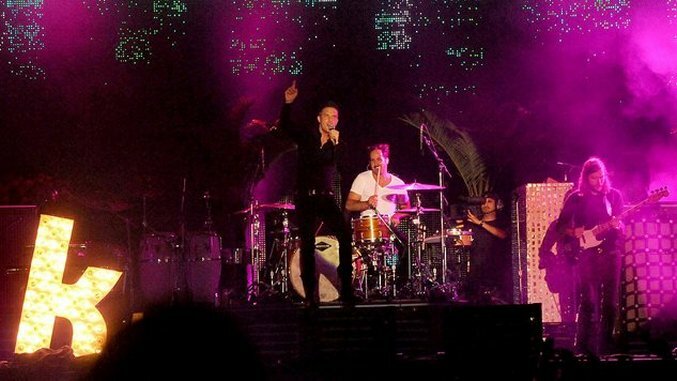 The real-life Las Vegas-based dance-pop group wrote songs about obsessing over jocks, break-ups, murder and posing the now-famous question, “Are we human or are we dancer?” Epitomized by their 2004 debut album Hot Fuss, The Killers were able to mix melancholic themes, dark lyrics, eclectic tastes and pop hooks in a way that was simply inescapable. And finally, the tease of new Killers music coming out this year has brought attention back to band after five years of silence. The band recently posted a picture of singer Brandon Flower with Anton Corbjin, the director who worked on the video for “All These Things That I’ve Done,” out in the desert. So today, on the 13th anniversary of Hot Fuss, and in the hopes of new music soon, we present the 10 best songs by The Killers. Continuing their tradition of releasing Christmastime singles, The Killers offered this digital-only single in 2008. Later, they put it on the compilation album (Red) Christmas EP, with proceeds benefitting AIDS research and the Project Red campaign. With its heartfelt, yet cheeky lyrics, “Joseph, Better You Than Me” imagines Saint Joseph’s personal challenges and public perception to being the father of Jesus. With its sharper, EDM-influenced sound, 2008’s Day and Age was a shift from previous records. “Human” is one of the highlights of the album, bringing a certain magic dust to a catchy nonsensical philosophical pondering (“Are we human or are we dancer?”). Another big hit from Day and Age, “Spaceman” is supposedly about being dissected and abducted by aliens, but it’s easy to make lot of great analogies for the song. Plus, the chorus is one of the better hooks on the record. Part of the aforementioned murder trilogy, “Jenny Was A Friend Of Mine” tells the story of the song’s narrator being interrogated about the murder of his now ex-lover. It begins with oblique electrical noises and what sounds like a running helicopter, vaguely reminiscent of Pink Floyd’s “Another Brick On The Wall.” With the addition of the slap bass line throughout the song, the suspense of the serious subject is mitigated by gyrating danceability. Even though “Somebody Told Me” became one of most recognizable Killers songs, when it was first released it actually did pretty poorly. However, when re-released, the song slowly grew in popularity and blew up to be one of the band’s biggest songs. Flowers once said that the song is about “trying to meet someone in a club.” The heavy introduction seduces you in and it’s incessant beat makes those legs start to kick. “All These Things That I’ve Done” serves as a contrast to the rest of Hot Fuss with its inherent earnestness. It’s a song that deals with life’s suffering and lack of meaning, while featuring the band’s most oblique line, “I got soul, but I’m not a soldier.” Plus, the song ends with the climactic gospel build-up with vocals from the Sweet Inspirations, a R&B group founded by Whitney Houston’s mother. Originally called “Little Angela,” their producer pushed the band to change the title and rework the song because, according to Flowers, it sounded too much like a “Mrs. Robinson” rip off. “Read My Mind” ended up being a hit and the least Bruce Springsteen-sounding song off 2006’s Sam’s Town. It’s another song about heartbreak, but delivered in that anthemic Killers way. “Tranquilize” appears on Sawdust an album of B-sides inspired by Oasis’s The Masterplan and The Smiths’ Hatful Hollow. The has a dark tone throughout and a more gritty sound than most of the Killers clean-pop catalogue, which probably led to its inclusion on this compilation. Although the lyrics are hard to unwind, the narrator speaks in images of destruction and paranoia, but also yearns for everything to be “sweet” and “unpolitical.” It’s fitting, then, that Lou Reed guests here. One of the Killers more melancholic songs, “Smile Like You Mean It” is about growing up, growing old, and as time passes, going to the places that now only exist in memory. With a mellifluous synth lead, it’s one of those songs that carries you into that nostalgic, contemplative space in your head. With melodic arpeggiated guitar hooks, a danceable, syncopated dance beat and clever wordplay, “Mr. Brightside” is one the Killer’s signature songs. And who can forget the offbeat line “And my stomach is sick / And it’s all in my head, but she’s touching his / Chest now, he takes off her dress now,” with the hesitation in Flowers’s delivery alluding to some other sorts of mischief. As the band’s debut single, “Mr. Brightside” helped The Killers foster a successful career that still continues today.